What’s worse than the thought of having termites inside your home eating away the biggest investment of your family? Having to repair and restore the holes after a traditional termite inspection that involves tapping, drilling and poking, and still get no definitive answers as to the presence or absence of these pesky wood eaters, their location, or the extent of damage they have done inside the walls of your house. Why don’t you avail of Bio-Tech Environmental’s FREE termite inspection using the latest termite detection technology Termatrac®T3i? Our highly trained and licensed termite control technicians can explain to you what’s going on behind those walls and recommend appropriate actions for you to take. Should there be a need for termite treatment, Termatrac®T3i allows for precise and targeted corrective actions that reduces potential exposure of your family members and pets to pesticides. Now that’s something to smile about. Bio-Tech Environmental’s commitment to safety is second to none, so we invest on the most advanced technologies to ensure the safety of our clients, our employees, and the environment. 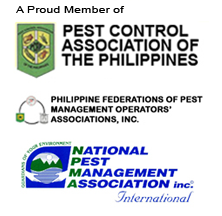 Call (02) 638-2566 for questions or to arrange for our FREE termite inspection.